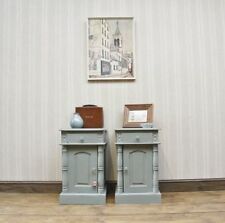 Matching pair of hand painted pine cabinets. 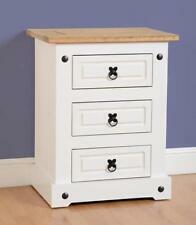 Perfect as large bedside tables or for the corner of a lounge as a lamp table/cabinet. Hand painted in Annie Sloan Aubusson Blue chalk paint and sealed with a hard wearing and waterproof matt finish sealer. Well used condition with heavy marks to the top of one, wear, scuffs, scratches throughout. Marks to the inside which would benefit from liners. Would make a great project. COLLECTION IN PERSON ONLY. Single Door Cupboard. Bedside Cabinet. A Modern Pine. Solid Pine. Occasional Little Indents To Pine. OLD & MODERN FURNITURE. One Man Service To The Door . OLD AND MODERN FURNITURE. Bedside Cabinets. Good Size Cabinets. Light Scuffs To Foot Of Cabinets. A Large Pair Of Contemporary. OLD & MODERN FURNITURE. 62.5cm Wide x 69cm High x 45cm Deep. OLD AND MODERN FURNITURE. (One Man Service To The Door.). 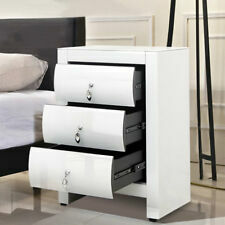 High Gloss White Glass Mirrored Bow Front Bedside Night Table Chest of 3 Drawers Cabinet. Scottish Highlands, Scottish Offshore Islands, N.Ireland, Channel Islands, Isle Of Wight, Isle Of Man. This stunning bedside is contemporary in design with gorgeous crystal glass handles giving it a chic and elegant look;. Single Drawer With Cupboard Below. General Surface Wear & Use Marks To Internal Cupboard. The Drawer Runs Smoothly, The Interior Drawer Is Marked & Paper Lining Torn. Perfect Bedside Or Side Lamp Table Size. High Gloss White Glass Mirrored Bow Front Bedside Night Table Chest of 3 Drawers Cabinet. This stunning bedside is contemporary in design with gorgeous crystal glass handles giving it a chic and elegant look;. Hand painted solid pine bedside cabinet painted in Authentico Herbs ( A pretty mint green ). Distressed for a shabby chic look and finished with a wipeable matt sealer. Solid drawer with a cupboard below. Jali styling. Handcrafted from high grade sheesham wood. Available in both left and right opening. Amazing value for money. Scotland : IV16 - IV56, PA20 - PA78 £69. Scotland : AB, DD £25. Scotland : IV1 - IV15, PA1 - PA19, PH1 - PH26 £25. Scottish Highlands, Scottish Offshore Islands, N.Ireland, Channel Islands, Isle Of Wight, Isle Of Man. High Gloss White Glass Mirrored Bow Front Bedside Night Table Chest of 3 Drawers Cabinet. This plain mirrored furniture is modern and clean in design with simple straight edges and beautiful bevelled edges. 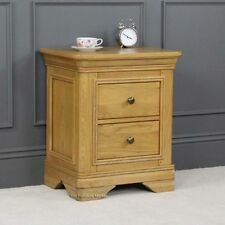 This solid wood bedside chest features 1 drawer and a cupboard below to keep all your essentials to hand. The top is the perfect spot for a table lamp to create a relaxing ambience in your room. 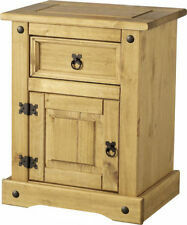 Collection Puerto Rico Bedside Chest - Light Pine. Corona solid pine furniture captures the essence of Mexican style furniture in a practical and affordable way, with a great selection of bedroom, dining, occasional and storage ideas. All products in our Corona collection are very generously proportioned, offer great storage opportunities whilst the wax finish we use is practical and easy to maintain. Metal drop handles complete the look along with optional complimenting pin detailing. Constructed from solid pine and pine plywood, Corona, is part of our “pine furniture collection” which also features real dovetail drawers, a true sign of premium craftsmanship. .
Corona grey washed finish is the most recent addition to our Corona furniture collections. The combination of South American style combines effortlessly with this new grey finish to give this great new look. All products in our Corona collection are very generously proportioned, offer great storage opportunities whilst the grey finish we use is practical and easy to maintain. Metal drop handles complete the look along with optional complimenting pin detailing. Constructed from solid pine and pine plywood, Corona, is part of our “painted furniture collection” which also features real dovetail drawers and raised and fielded panel doors, a true sign of craftsmanship. .
For Sideboard search183253719806. For Cupboard Bookcase search183255106351. For Cupboard search183256683145. For Bookcase search183255089615. For Bookcase search183253673239. For Tall Bookcase search 183253601583.